I completed my first JMT hike in 2002, solo from Tuolumne Meadows to Mt. Whitney. 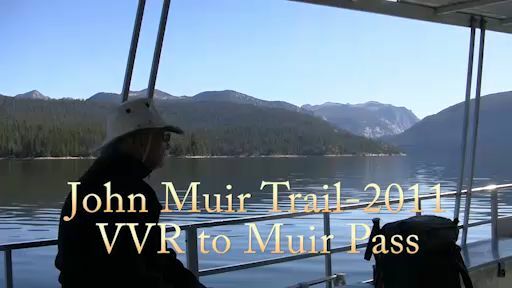 In 2004, accompanied by my wife, our journey began at Happy Isles, to traverse the full length of the Trail to Mt. Whitney. 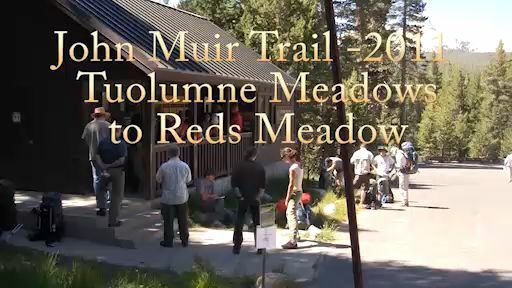 Since then, our annual stroll on the JMT has always started at Tuolumne Meadows; once was enough coming out of Yosemite Valley because it’s a zoo down there! Comparing our schedules from 2004 to 2011, the daily distances, campsites and resupply activities have changed little over the years. What has changed is the reduced weight in, and on, our packs, somewhat compensating for advancing age. I was 72 this year and my Aussie mate, Mike, was 67, so we need all the help we can get with the latest lightweight equipment and clothing. Mike will be returning for another August start date in 2012 and already we've decided on the purchase of new gear that should carve 3-4 lbs off the Equipment List. We’ve never mailed resupply packages to any location; instead, we've exited the the Trail at Reds Meadow for one day at Mammoth, positioned a vehicle at South Lake and then back on the Trail for seven days. This includes hiking out over Bishop Pass from LeConte RS to South Lake, adding 26 miles and 5,000’ to the JMT journey. Allowing a minimum one zero day in Bishop, which has included positioning a vehicle at Whitney Portal, it's back over Bishop Pass for the eight day hike to the summit of Whitney ... and out to the Portal. 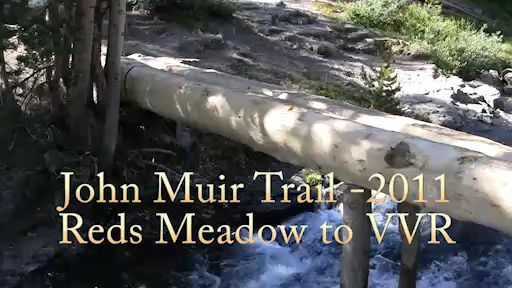 This year's hike down the John Muir Trail was a pleasant return to my 2004 to 2007 adventures on the Trail. I travelled with an experienced mountain companion, Mike Fox, who didn't bailout on me for the journey. Sadly, I had to bail on him over Kearsarge Pass to Onion Valley because of a vertigo problem I'd experienced at Rae Lakes. Mike continued solo to the summit of Whitney and the Portal, where I was waiting to drive him back to Reno in sufficient time for his return flights to Australia. Two weeks later, I returned to Onion Valley to finish the Trail solo to Whitney. I camped the first night at the pond below Kearsarge Lakes and was back on the JMT early on the second morning. 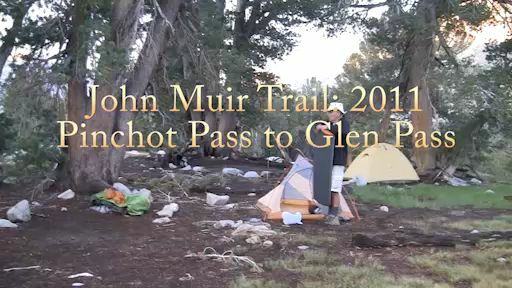 There, I met with three hikers who'd camped near the JMT intersection. That evening, we all camped at the high site at 11,200', on the northern side of Forester Pass. My schedule called for an additional day off the Trail to climb the 14,000' Tyndal Peak, but after crossing Forester Pass, increasing pain in my left knee indicated that I'd be lucky to even make it to Whitney Portal, never mind the ascent of Tyndal Peak! So on the third night I stopped at the Tyndal Creek campsite and settled into a relaxed evening with John, Luke and Russell; the three hikers from Las Vegas. Later, we were entertained by Turtle, a story-telling JMT thru-hiker who'd lost his companions, and tent, but was continuing, albeit slowly, with a heavy tarpaulin for shelter. On the fourth morning I set off for Guitar Lake before the others, but was soon passed by John crossing the Bighorn Plateau. After that meeting, my left knee became a serious handicap to my progress and even after dosing on extra Advil, it was an agonizing journey to Guitar Lake. John was waiting there for his companions, who eventually arrived in the middle of a hailstorm and lightning strikes! Lying in my tent that last night, I was concerned about my ability to climb up over Trail Pass (a Whitney summit attempt was not an option) and stagger down the 6'000' to the Portal. When Turtle arrived at our camp, he suggested that I use an ice pack, made from hailstones, to bring down the swelling and then wrap the knee with an Ace bandage for the following day's hiking. He did a good job with the wrap and I set off at first light for the 3,000' climb feeling reasonably confident that I could make it out under my own steam. In the event, the hike over Trail Crest and down to the Portal was one of the toughest days I’ve had to endure on the JMT. The climb to the Crest went okay; I was able to keep up with Luke and Russell, but John was well ahead of us and reached the summit before we made the intersection. My initial descent down the switchbacks was manageable, until deciding to remove the Ace bandage that Turtle had put on my knee. Big mistake! The constant high step-downs through the granite slabs created great pain until I finally decided to replace the bandage, but by then the damage was done and the subsequent drive to Reno was a journey of agony. Five months later, as I write this journal entry, I'm scheduled for a total knee replacement two weeks from now. The pain and swelling never did go away, despite various treatments and limited hiking activity. The many years of climbing and long distance hiking have worn my left knee to the bone, literally! It'll be an interesting 2012 summer season for me. I'm optimistic that I will be able to hike the JMT once more in August, maybe with the clinking and clanking of a bionic knee, but with far less pain. 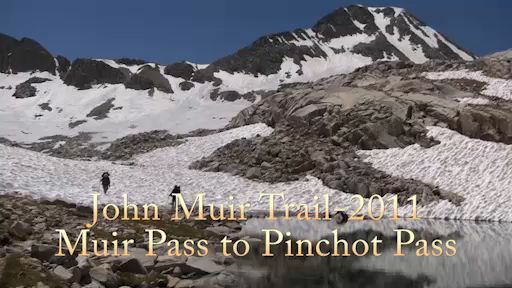 The journey on the John Muir Trail for 2011 is well documented in the five attached videos which were taken in full HD with a Canon Vixia HFS10. In the last video, some footage came from my Canon PowerShot G9.